The RSI Floating and hydroponic seeding tray from Riverstone Industries helps add to the ease of growing plants from scratch. The commercial grade polystyrene floating trays are designed to wick water to the new seedlings as needed, helping to keep the new plants perfectly hydrated with minimal attendance. The design and use is very simple, create a pool of water in which the trays can float, plant the seeds in tray, and what them grow!! The design of the commercially grade seeding trays ensures years of use. This unit has 1- each of the 128 & 242 pyramid shaped cell trays, which virtually eliminate transplant shock. Advantages: undamaged roots, plants and all the soil slide out simply and easily. This design eliminates roots getting tangled or needing to be torn for removal. entangled roots, no spreading of root pests or diseases. This design and stronger root system also help to promote a higher rate of transplanting success, as high as 90%. Can grow 128 or 242 plants per tray. Will float and is reusable. Grows a stronger root system and increases success rate of transplanting. Able to be used for hydroponic growing. Made from polystyrene (commercial grade) that will last for years. An ideal row crop planter, the 1001-B is a tool that takes the guesswork out of planting any row crop. Heres how it works: install one of the precision seed plates that best fits your seed, then adjust the depth of planting on the ground opener, and then set your 30 long row marker for the desired width, then fill the seed hopper with seeds, then begin pushing in your well tilled soil, thats it. The results will speak for themselves when days later you look at your garden and see all the row crops come out of the ground at the same time; perfect, making you the envy of all gardeners who dont have the 1001-B. Enhance your living space with this ready to display orchid. Comes in an assortment of colours with single or multi stems in a decorative grey pot. Nyjer is an imported and processed seed that is widely used in North America for feeding a wide variety of wild finches. Hydroponic Seed Tray -128 and 242 Plugs The RSI Floating and hydroponic seeding tray from Riverstone Industries helps add to the ease of growing plants from scratch. 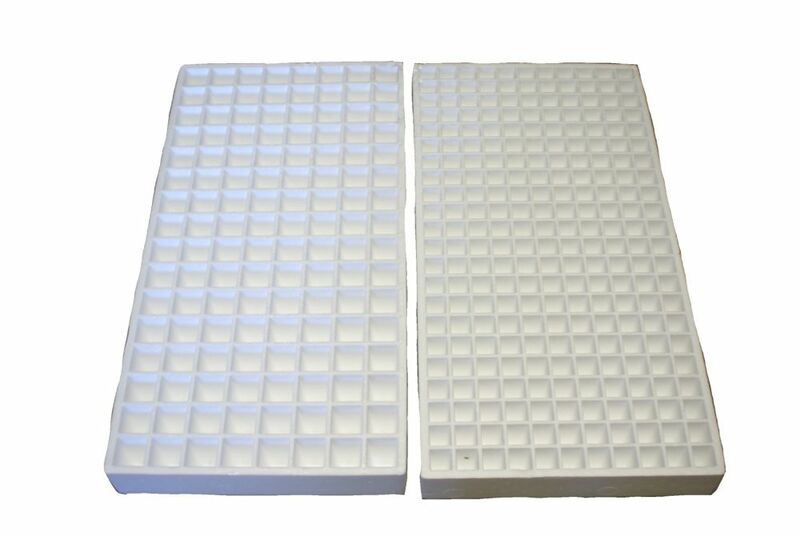 The commercial grade polystyrene floating trays are designed to wick water to the new seedlings as needed, helping to keep the new plants perfectly hydrated with minimal attendance. The design and use is very simple, create a pool of water in which the trays can float, plant the seeds in tray, and what them grow!! The design of the commercially grade seeding trays ensures years of use. This unit has 1- each of the 128 & 242 pyramid shaped cell trays, which virtually eliminate transplant shock. Advantages: undamaged roots, plants and all the soil slide out simply and easily. This design eliminates roots getting tangled or needing to be torn for removal. entangled roots, no spreading of root pests or diseases. This design and stronger root system also help to promote a higher rate of transplanting success, as high as 90%.